There’s nothing more rewarding than the faces beaming with smiles, sparkling eyes and dropping jaws after I open up the pack and unleash my creation. This one was for my gorgeous little niece, Susanna’s 4th birthday. My affair with chocolate is world known by now. It has a huge fan-following in our family too. 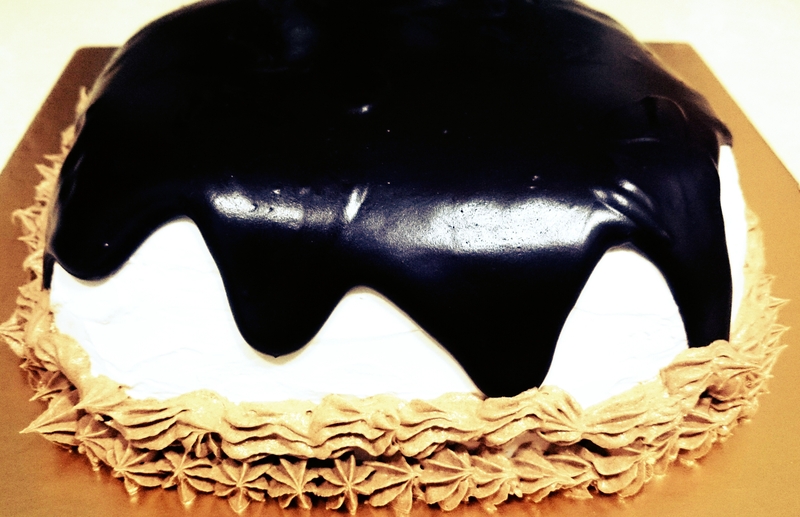 So this time I thought of going simple with the cake and festooning it with the satiny layers of Whipped Cream and finger-licking Truffle Icing. 1. Preheat the oven to 160C. Butter and dust the sides of a 8 inches or 21cm cake tin and keep aside. 2. Sift the flour, cocoa powder and baking powder. 3. Cream the butter and sugar with electric beater. 4. While beating, add eggs one by one and continue beating till fluffy . 5. Now add the dry sifted ingredients and fold. 6. Tip the mixture into the prepared tin. 8. Bake for 35 minutes or until a skewer inserted into the centre of the cake comes out clean. 9. In a bowl, break the chocolate into small pieces. This expedites the melting process. 10. In a separate bowl, heat the fresh cream till it comes to boil. 11. Now pour the hot cream over chocolate and swirl the bowl letting the chocolate melt on its own. 12. Add little butter for that extra glaze and stir lightly. 1. Slice the cake in 2 or 3 layers as per your wish. 2. Dollop the whipped cream over the last layer and spread evenly. 3. Repeat the process for the balance layers alternating with cake and cream. 4. Cover the layers with the balance cream and spread evenly all over. 5. Now pour the truffle icing over the cake and let it drizzle from the sides. P.S. : In between the layers, sprinkle some choco chips / spread little blueberry or strawberry crush to up the ante. You can also add the choco chips in the cake mix before leaving it to bake. Holy macaroni! This looks amazing!